Dieterich Buxtehude is regarded as one of the most influential musicians of the 17th century in Northern Europe. 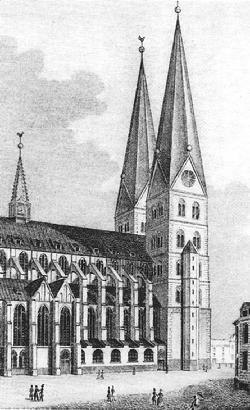 In 1668, he succeeded Franz Tunder as organist at the Marienkirche in the Imperial city of Lübeck. Here he began a long-standing tradition of evening concerts at the church, known as Abendmusik which attracted musicians from all over Europe including Georg Frederic Handel and the great musical theorist and composer Johann Mattheson. In October 1705, J.S. Bach famously walked some 200 miles from Arnstadt to Lübeck to hear Buxtehude play and "to comprehend one thing and another about his art". He clearly encountered something extraordinary, for having obtained only four weeks leave from the church council in Arnstadt, Bach remained in Lübeck for four months! 2007 marked the tercentenary of Buxtehude's death, and in celebration of this Anniversary year, Andrew Arthur performed the complete organ works of this great North German master. This vast project incorporated events in the UK, Northern Europe and the U.S.A, and highlighted instruments from a wide variety of traditions. 16th, 23rd & 30th July, Mission Basilica, Carmel, California, U.S.A.